The assignment was to create a self portrait with some encouraging "I believe" statement and its scripture reference. Since it rained the whole time that the contest was open for entry, it took me a while to figure out what I wanted to do. Saturday night the rain finally slowed down and on my drive back from a church event, I noticed that the mist made all the lights glow beautifully! Luckily I had my camera with me, so I stopped in the Georgetown square and set up my tripod. I loved the way the photos came out, but they felt so lonely! As I was thinking about it, however, I realized that many times in my life I have felt very lonely, even when surrounded by people. Now however, even when I am physically alone, I know that my God will always be with me. 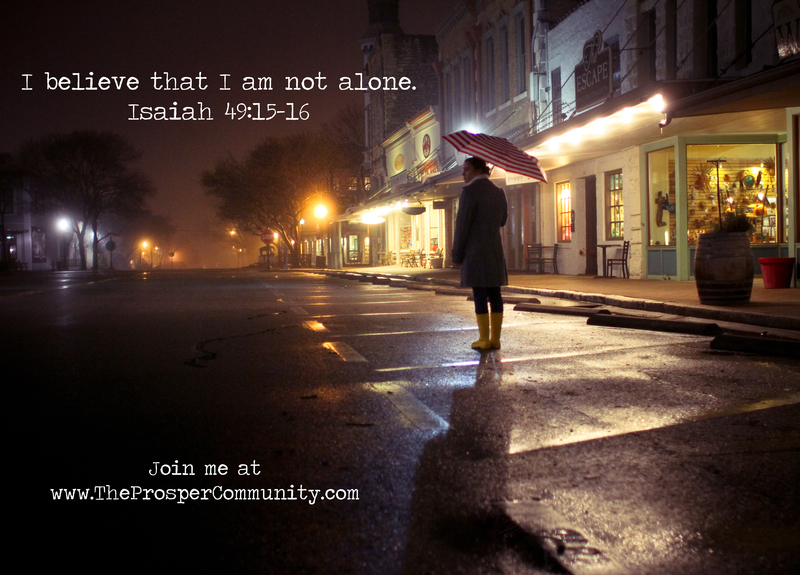 My mind quickly went to Isaiah 49:15-16, which has been one of my favorite scriptures since I learned of Jesus' breathtaking love four years ago. It says that even if my mother and father forsake me, my name is written on the palm of God's hand. I love the intimacy of hands, so the thought of my name inscribed on the palm of God's hand strikes a deep chord in me. A year ago, I just about fell over when I realized that my name was physically carved into Jesus's hands with the nails he took for me! Woah. So much tenderness, paid in blood.